Location targeting within Bing Ads will give your campaign and or ad groups more precise targeting for your ads. 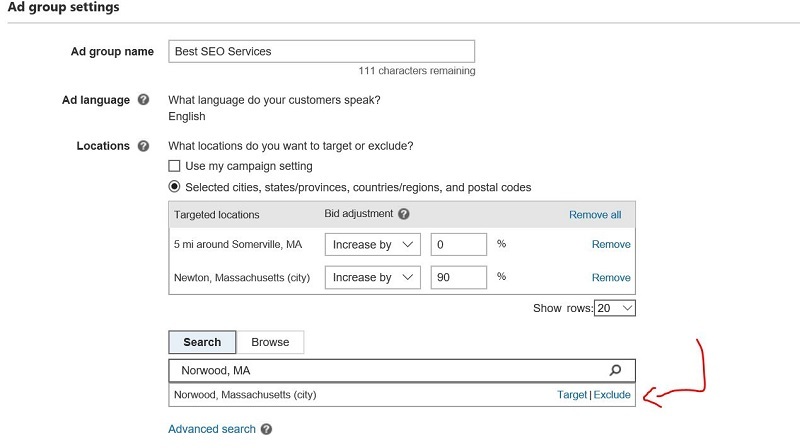 You can set the location targeting to a particular city, a radius around that city, or even exclude cities that might not be relevant for your ads. Let’s get started. For this video example, I want to override my campaign settings and specifically target certain locations for this ad group and the keywords associated to it. In this example, I just have Newton set as my targeted radius for this ad group. While that might be relevant for my business, I am probably missing out an a bigger audience that is right next to Newton. When you click on the advanced search link, you are brought to this page in Bing Ads that will show you exactly where you are targeting. You will notice that I am just targeting Newton, but I am missing out on Boston and all the surrounding cities around that. So that picture above shows how much of an audience we are truly missing by just targeting the city of Newton. Now, I can type in Somerville into the area targeting, but I am going to get something similar to what I have with Newton. As a note, you know your business the best. If it truly only makes sense to target specific cities only then you should, but if you are open to cities around that area, I would recommend testing out the radius option. After typing in the city and clicking on a five mile radius, I am shown a map of reach like this. This is pretty amazing as you can truly see how much a five mile radius can cover for your business. So this entire example was how to target certain locations, but there might be areas that you specifically don’t want to target. You can either exclude the target right in the same interface as we are in, or you can exclude the target location in the settings area in the UI. If you wanted to exclude the location within where we are currently, you should take a look at this picture below to get an idea how to do that. If you want to exclude the location in the settings section in the UI, you just need to reference the picture below. In this example below, I have a few different things going on. I am specifically tagetting Newton, but I am also targeting a radius around the city of Somerville. Let’s say I have a phycial location and want people to go to, I might want to target users who are in Newton a bit more aggressively. For this example, I am telling Bing Ads that I want to bid 90% higher when one of these searchers happen to perform a search for my service in Newton. You can do so much within location targeting to maximize your PPC strategy. You can also add things like location extensions and call extensions to get an even deeper local reach. Remember, you should also look at things like the campaign planner trend to see how your audience searches for your services. If you see that a good amount of your audience is using a smartphone, you should bid even higher to not only be shown higher to the mobile users, but have those extensions to allow them to get directions to your location, or even have the ability to make that call (reservation perhaps) for your business without even clicking on that ad.